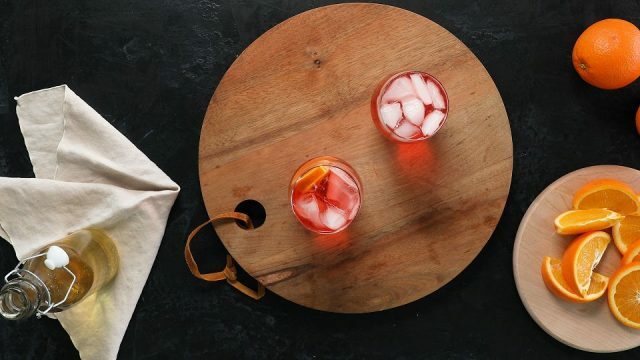 In celebration of warmer weather ahead, we’re riffing on one of our favorite low-proof cocktails, the Campari Spritz. This Italian aperitif, consisting of sparkling wine, Campari (a ruby red herbal, bitter liqueur, often served before meals) and soda water, is the perfect thing to sip on a mild afternoon along with some salty snacks and good company. In our version, cider steps in for the sparkling wine, adding a nice touch of sweetness and depth to the cocktail, but keeping the alcohol content low. Trust us, this is a good thing when you’ve got the whole evening stretching ahead of you — a round or two won’t rob you of your wits. Use whatever modern cider you’ve got on hand, preferably something sessionable and dry. Don’t forget the wedge of fresh orange to garnish, as its acidic zestiness lifts the whole drink and keeps you coming back for more. Fill a cocktail glass with ice. Add hard cider, Campari and orange wedge. Top with seltzer. Stir and garnish with an orange wedge. Cider Culture can create and showcase recipes featuring your cider product!